First off, I don’t think I need a speech writer for what I’m going to say at our wedding. 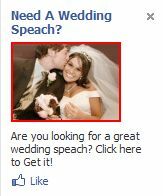 Secondly, I wouldn’t hire a speech writer who can’t even spell the word speech. The sad thing is that they’ve spent money to put this ad up.